One of the biggest surprises of free agency this year came when linebacker Anthony Barr, who had agreed to sign with the Jets, suddenly reversed course and opted to re-sign with the Vikings for less money than he would have earned with Gang Green. 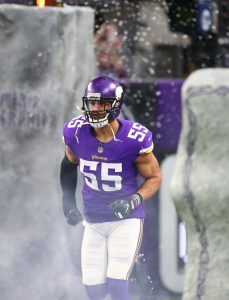 At the time the news broke, we knew only that Barr wanted to remain with Minnesota and that the Vikings had sweetened their offer to convince him to return. But in a lengthy and fascinating piece that is worth a full read, Courtney Cronin and Rich Cimini of ESPN.com detail exactly how Barr’s decision played out. The ESPN scribes write that, when the legal tampering period opened on March 11, Barr had a few suitors, but the Jets quickly rose to the top of the list because of how much money they could offer. Barr had identified the Jets — who planned to capitalize on his athleticism as a blitzer and his ability to drop into coverage — as his top choice if he couldn’t remain with the Vikings. New York, which signed linebacker C.J. Mosley not long before Barr canceled his deal with the Jets, had every intention of bringing Mosley and Barr into the fold. Barr did not want to back out of the Jets deal since he had given them his word, but Williams called Gang Green to let them know Barr was having second thoughts. Minnesota, meanwhile, was convinced it could not re-sign Barr because of its shortage of cap space, and rather than extending what it felt would be a disrespectful, low-ball offer, it stayed out of the sweepstakes entirely. So the Vikings were very surprised to get a “frantic” call from Williams asking for the team’s best and final offer. Minnesota extended itself as far as it could go, the Jets offered to fly Barr out to New York to convince him to come to the Big Apple, and the decision was in Barr’s hands. Of course, he ultimately chose to accept Minnesota’s offer, and the excitement he felt when Williams told him he was back with the Vikings proves to him that he made the right choice. I love hearing that sometimes it isn’t only about money …. Yes, because he just did not want to play in such a large market! NY is not for everybody! I don’t think it’s the market, I think it’s the culture of the Jets.